Oration 25, "In Praise of Heron the Philosopher", was delivered in 380 A.D. by St. Gregory the Theologian on behalf of Maximus the Cynic, here called "Heron the Philosopher", a convert to Christianity initially admired by Gregory, but not so much after being betrayed by him when he attempted to consecrate himself Archbishop of Constantinople over Gregory. Which makes it a matter of curiosity as to why "Heron the Philosopher" is honored as a Saint of the Church and is celebrated on August 10th. 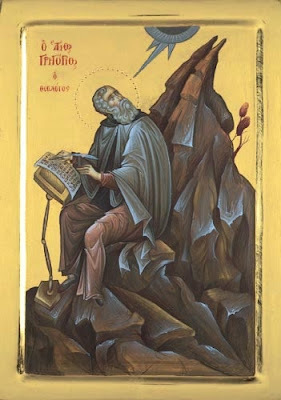 This "Heron" celebrated on August 10th is considered by St. Nikodemos the Hagiorite to be the subject of Gregory the Theologian's Oration 25, though he seems to be ignorant, as were perhaps those who canonized him and numbered him among the saints, of the association between Heron and Maximus the Cynic, whose elevation to the Throne of Constantinople was even condemned by the Second Ecumenical Synod. However, the reason for his being numbered among the saints seems to be based solely on this Oration of Gregory, and not for the controversies that ensued after it was delivered, and thus is urging us to read the Oration. Can we assume he died in repentance, which history does not record, and returned to his former way of life prior to the controversies? Perhaps. Though it should also be noted that some lists of saints do not include his name for commemoration of August 10th, and instead have a martyr named Hiraidos. The opening lines of this Oration are one of the best patristic defenses of philosophy when used for its proper purpose, that is, not for doing theology but for communicating theology reasonably and living a life of virtue, since Gregory most admired Maximus for his strong defense of Orthodoxy against heresy and his virtuous life. Philosophy, for Gregory, is above all living according to the teachings of Christ, without distraction or deviation, and imitating His love for others, and has nothing to do with intellectual speculations. A true philosopher is a supremely free being in Christ, because he is free from the shackles of the passions and sin. Once this take place, we can "philosophize about God", as Gregory explains in his Five Theological Orations, and this is the highest form of philosophy, which is essentially the communication of empirical theology. "I shall praise the philosopher, even though I am not feeling well, because it is the philosophic thing to do. The praise, moreover, will be highly deserved since he is truly a lover of wisdom while I am but her devoted servant. I therefore have in fact good reason to offer praise: if in no other way, I can at the very least show my philosophic bent by expressing my admiration for a philosopher. My reasoning is that we must either engage in philosophy ourselves, or else hold it in high regard. Otherwise, we may very well find ourselves completely cut off from the good and adjudged guilty of unreason even though we were endowed with reason at birth and through logic avidly pursue the Logos. Let the man accept our praise, as he does everything else, in a philosophic spirit and receive our accolades with good grace. Since we know that the philosopher shrinks from public recognition and, further, that no words of ours could add anything to the facts and might even, because of their inadequacy, diminish his standing, our object in praising him is not to indulge him but to improve ourselves. The goal is one that philosophy will not now reject since her earnest efforts are in fact directed towards a betterment of our lives. And first among her benefactions is the praise of good things, for praise is the offspring of ardent devotion, and devotion of virtue, and virtue of blessedness, the pinnacle of our aspirations and the one to which the earnest man directs all his actions." Crushing the errors of sophists, whose heads were bound.